Don’t fall for the whitening of this narrative. If you’re not convinced, do the research. Start with other perspectives of this event. I, Chief Arvol Looking Horse, of the Lakota, Dakota, and Nakota Nations, ask you to understand an Indigenous perspective on what has happened in America, what we call “Turtle Island.” My words seek to unite the global community through a message from our sacred ceremonies to unite spiritually, each in our own ways of beliefs in the Creator. We have been warned from ancient prophecies of these times we live in today, but have also been given a very important message about a solution to turn these terrible times. To understand the depth of this message you must recognize the importance of Sacred Sites and realize the interconnectedness of what is happening today, in reflection of the continued massacres that are occurring on other lands and our own Americas. I have been learning about these important issues since the age of 12 when I received the Sacred White Buffalo Calf Pipe Bundle and its teachings. Our people have strived to protect Sacred Sites from the beginning of time. These places have been violated for centuries and have brought us to the predicament that we are in at the global level. Look around you. Our Mother Earth is very ill from these violations, and we are on the brink of destroying the possibility of a healthy and nurturing survival for generations to come, our children’s children. Our ancestors have been trying to protect our Sacred Site called the Sacred Black Hills in South Dakota, “Heart of Everything That Is,” from continued violations. Our ancestors never saw a satellite view of this site, but now that those pictures are available, we see that it is in the shape of a heart and, when fast-forwarded, it looks like a heart pumping. The Diné have been protecting Big Mountain, calling it the liver of the earth, and we are suffering and going to suffer more from the extraction of the coal there and the poisoning processes used in doing so. The Aborigines have warned of the contaminating effects of global warming on the Coral Reefs, which they see as Mother Earth’s blood purifier. The indigenous people of the rainforest say that the rainforests are the lungs of the planet and need protection. The coastal plain is the birthplace of many life forms of the animal nations. The death of these animal nations will destroy indigenous nations in this territory. The Indigenous people warn that these destructive developments will cause havoc globally. There are many, many more indigenous teachings and knowledge about Mother Earth’s Sacred Sites, her chakras, and connections to our spirit that will surely affect our future generations. There needs to be a fast move toward other forms of energy that are safe for all nations upon Mother Earth. We need to understand the types of minds that are continuing to destroy the spirit of our whole global community. Unless we do this, the powers of destruction will overwhelm us. Our Ancestors foretold that water would someday be for sale. Back then this was hard to believe, since the water was so plentiful, so pure, and so full of energy, nutrition and spirit. Today we have to buy pure water, and even then the nutritional minerals have been taken out; it’s just empty liquid. Someday water will be like gold, too expensive to afford. Not everyone will have the right to drink safe water. We fail to appreciate and honor our Sacred Sites, ripping out the minerals and gifts that lay underneath them as if Mother Earth were simply a resource, instead of the source of life itself. Attacking nations and using more resources to carry out destruction in the name of peace is not the answer! We need to understand how all these decisions affect the global nation; we will not be immune to its repercussions. Allowing continual contamination of our food and land is affecting the way we think. A “disease of the mind” has set in world leaders and many members of our global community, with their belief that a solution of retaliation and destruction of peoples will bring peace. In our prophecies it is told that we are now at the crossroads: Either unite spiritually as a global nation, or be faced with chaos, disasters, diseases, and tears from our relatives’ eyes. We are the only species that is destroying the source of life, meaning Mother Earth, in the name of power, mineral resources, and ownership of land. Using chemicals and methods of warfare that are doing irreversible damage, as Mother Earth is becoming tired and cannot sustain any more impacts of war. I ask you to join me on this endeavor. Our vision is for the peoples of all continents, regardless of their beliefs in the Creator, to come together as one at their Sacred Sites to pray and meditate and commune with one another, thus promoting an energy shift to heal our Mother Earth and achieve a universal consciousness toward attaining Peace. As each day passes, I ask all nations to begin a global effort, and remember to give thanks for the sacred food that has been gifted to us by our Mother Earth, so the nutritional energy of medicine can be guided to heal our minds and spirits. This new millennium will usher in an age of harmony or it will bring the end of life as we know it. Starvation, war, and toxic waste have been the hallmark of the great myth of progress and development that ruled the last millennium. To us, as caretakers of the heart of Mother Earth, falls the responsibility of turning back the powers of destruction. You yourself are the one who must decide. You alone – and only you – can make this crucial choice, to walk in honor or to dishonor your relatives. On your decision depends the fate of the entire World. Each of us is put here in this time and this place to personally decide the future of humankind. Did you think the Creator would create unnecessary people in a time of such terrible danger? Know that you yourself are essential to this world. Understand both the blessing and the burden of that. You yourself are desperately needed to save the soul of this world. Did you think you were put here for something less? In a Sacred Hoop of Life, there is no beginning and no ending. Chief Arvol Looking Horse is the author of White Buffalo Teachings. A tireless advocate of maintaining traditional spiritual practices, Chief Looking Horse is a member of Big Foot Riders, which memorializes the massacre of Big Foot’s band at Wounded Knee. South Dakota’s Republican leadership of John Thune and Kristi Noem always march lockstep with the other Republican robots. Neither of them care that South Dakota’s largest minority, the people of the Great Sioux Nation, diametrically oppose the Pipeline and they also fail to understand the determination of the Indian people to stop it. The House vote was 252-161 favoring the bill. The bill was sponsored by Rep. Bill Cassidy (R-La.) who is trying to take the senate seat from Democrat Mary Landrieu, They are headed for a senate runoff on December 6 and Landrieu has expressed a strong support of the bill in hopes of holding her senate seat. Two hundred twenty-one Republicans supported the bill which made the Republican support unanimous while 31 Democrats joined the Republicans. One hundred sixty-one Democrats rejected the bill. 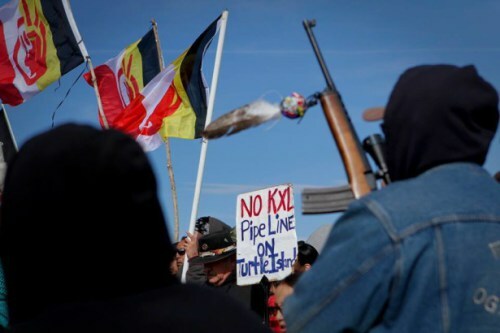 Progressive newsman and commentator for MSNBC, Ed Schultz, traveled to the Rosebud Indian Reservation in South Dakota this year to meet with the Indian opponents of the Pipeline. 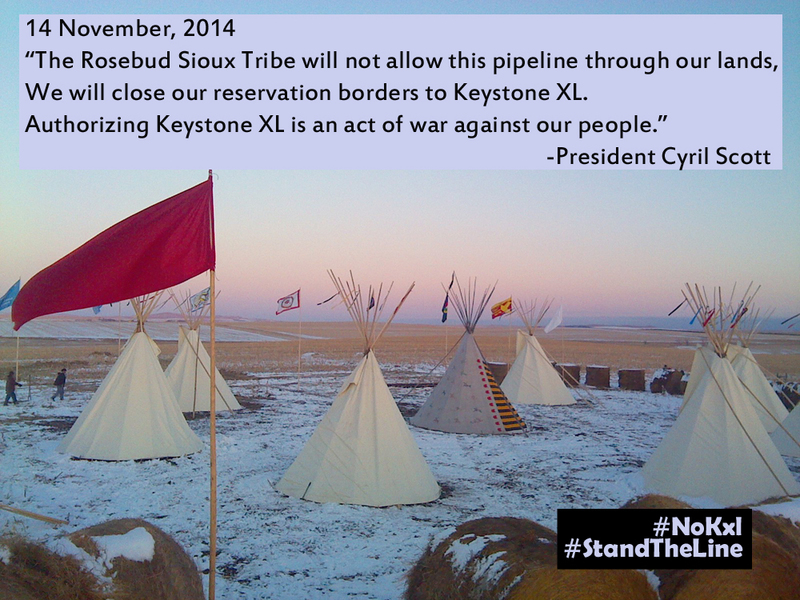 Firsthand he witnessed the absolute determination of the Indian nations to stop construction of the Pipeline. He witnessed their determination and reported on it. Except for Schultz the national media shows no interest and apparently has no knowledge of how the Indian people feel about the Pipeline nor do they comprehend that they will go to their deaths stopping it. What is wrong with the national media when it comes to Indians? As an example of the national media’s apathy, the Lakota, Nakota and Dakota have turned their backs on the $1.5 billion dollars offered to them for settling the Black Hills Claim and although they are among the poorest of all Americans, the national media does not consider this news. Why do they protest the XL Pipeline? Because the lands the Pipeline will cross are Sacred Treaty Lands and to violate these lands by digging ditches for the pipelines is blasphemes to the beliefs of the Native Americans. Violating the human and religious rights of a people in order to create jobs and low cost fuel is the worst form of capitalism. 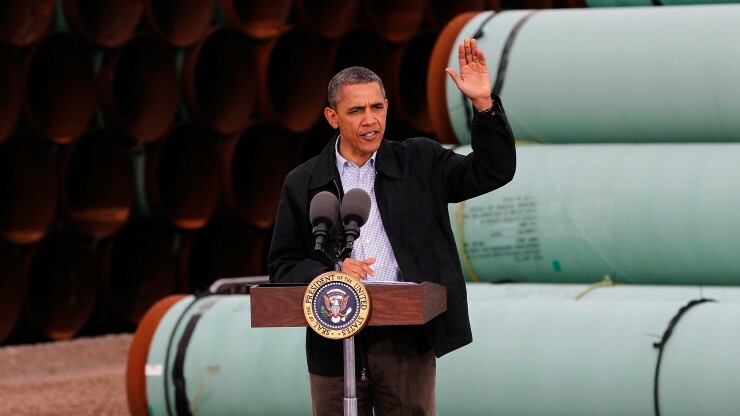 Will the Pipeline bring down the cost of fuel and create thousands of jobs? President Obama at the southern site of the Keystone XL pipeline, March 22, 2012 in Cushing, Okla. In the meantime Senator Landrieu conceded that it is unlikely that the Senate and the House will have the two-thirds majority needed to override an Obama veto. Wizipan Little Elk of the Rosebud Sioux Tribe and a coalition of tribal leaders from across the Northern Plains and the United States have pulled no punches on how they intend to fight the Pipeline to the death if that is the only way to stop it. South Dakota’s elected leadership has totally ignored the protests of the largest minority residing in their state. They have also totally underestimated and misunderstood the inherent determination of the Indian people. This is a huge mistake that will have national implications and it is taking place right under their Republican noses. What is even worse South Dakota’s media has also buried its collective heads in the sand even though Native Sun News has been reporting on the Keystone XL Pipeline since 2006. Award-winning Health and Environment Editor for Native Sun News, Talli Nauman, has been at the journalistic forefront of this environmental disaster about to happen from day one and she has been rewarded by the South Dakota Newspaper Association with many awards for her yearly series of articles on this most important topic. Until this issue became a political football, the rest of South Dakota’s media had been silent. The Keystone XL Pipeline that is being pushed by TransCanada may well be the beginning of the final war between the United States government and the Indian Nations. A word of caution to TransCanada and the U.S. Government: please do not disregard the determination of the Indian people when they say they will fight this Pipeline to their deaths if need be. They mean it!